Safety Compliance Services can provide your construction project or maintenance outage with an experienced high-quality safety supervisor to assist you with ensuring a safe and regulatory compliant project. Whether you need day or night shift coverage or 24/7 support, we will integrate with your safety department to create a seamless safety team representing your company. We have extensive experience providing safety oversight at power generation facility maintenance outages as well short and long term construction projects. We have changed the game of traditional safety supervisor service. When we implemented our Safety Supervisor service, we looked at what our years of experience in working with clients during maintenance outages and construction projects showed us what were often unmet safety needs at their sites and we developed our service to specifically fill these gaps. Deficiency: Safety supervisors are often viewed as “enforcers” and compliance by many contractors with policies and regulations typically only apply when the eyes of the “enforcers” are on them. Solution: We strive to build relationships with site supervisors, trades people, and laborers to develop a safety culture at the worksite. We mentor, advise, and inform when unsafe acts or conditions are discovered. We only “enforce” when absolutely necessary. Our firmly held philosophy is that no one wants to be unsafe; when someone commits an unsafe act, they either don’t recognize the hazard or haven’t been taught a better way. We strive to educate and inform rather than “enforce” whenever possible. Deficiency: On long term projects, even the most conscientious Safety supervisors, whether contracted or in-house, can often get “site fatigue” and become complacent. Often, what’s termed “normalcy of deviance”, whereby a gradual shift from original “norms” in safe behaviors and conditions becomes accepted as the new “norm” goes undetected due to natural human and organizational complacency which often sets in on long term projects. Solution: We believe in rotating our Safety supervisors on long term projects to minimize complacency and ensure a “fresh” set of perspectives is brought in to oversee safety on a regular basis. Doing so ensures the “fresh” Safety supervisor is seeing the work site and looking at actions and conditions at the worksite from the perspective of original “safety norms” and can recognize and correct safety deviations before they become “normalized” through complacency. For every project we are contracted for, we establish standard operating procedures and protocols for our Safety supervisors in conjunction with each client to ensure our service is tailored to each client’s wants and needs and the transitions between rotating Safety supervisors is seamless to the client. To the client, the rotation of Safety supervisors is seamless. To the overall safety of the worksite, the rotation of Safety supervisors provides great advantages in maintaining a safe work environment and minimizing the development of organizational complacency on the part of the employees and contractors at the site. Deficiency: The nature of construction projects and maintenance outages and the large workforce often present, creates a high possibility for illness or minor injury during such projects. Response to a medical emergency is often quite limited at worksites due to location and/or minimal first aid training and equipment available at the site. Solution: All of our Safety Supervisors are certified, experienced Emergency Medical Technicians and are deployed with a full trauma EMS bag and AED to ensure adequate equipment, training and real life experience to handle whatever medical situation arises while our personnel are on duty. Deficiency: At many construction sites and particularly at maintenance outages, work often involves entering confined spaces. Although many companies have in-house capability to execute basic confined space rescue, most lack the experience and expertise to feel confident that, should a confined space accident happen, their on-site personnel could calmly and effectively plan, stage, and execute a rapid rescue. 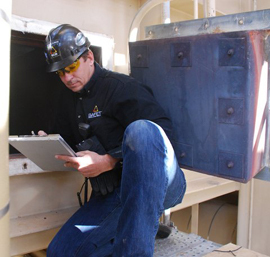 Solution: All of our Safety Supervisors are certified, experienced Confined Space Rescue Technicians. As part of our role in overseeing site safety, our supervisors also assess and plan rescues from all confined space entries undertaken. Although our Safety Supervisors are not deployed with a rescue contingent of manpower and resources they do all have experience serving on our Rescue Team and are very capable of working with site personnel and equipment to lead and/or assist in confined space rescue. Deficiency: Most safety supervisors are independent contractors who, while often quite experienced at what they do, often lack the depth and breadth of knowledge necessary to properly support all potential scenarios that may arise on a worksite. Solution: When you hire Safety Compliance Services you receive our entire team as site support. We take our staff and 21 plus years of experience and place them at the disposal of not only our on-site Safety Supervisor, but your safety staff as well. If any issues or scenarios should arise at the work site and our site supervisor or your staff need more information, interpretation, or possible solutions, our entire staff is always ready to assist at no additional service cost.